AS A HISTORICAL RECORD OF STORMY EVENTS IN BANGLADESH SINCE ITS BIRTH TO THE ACCESSION TO POWER OF GENERAL ZIA, IT WILL BE TREATED BY SCHOLARS AND JOURNALISTS ALIKE AS A CLASSIC. ONE COULD SYMPATHISE with Lifschultz’s agony; that without the power of subpoena, truth could never be discovered. But could it be revealed even with that power? Lifschultz still hopes that he can, given the opportunity and a fair chance, find the truth. But the deviousness and capacity of intelligence agencies to kill the truth, at all stages of any legitimate investigation would, however, seem adequate for making Lifschultz’s task a difficult one. 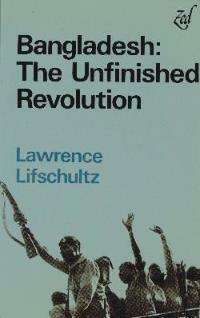 In these dangerous shoals, the great service Lifschultz offers to the ordinary man is simply to impress upon him the oppressive apparatus of today’s state…If, in such conditions, the Bangladesh Revolution is unfinished, so is Lifschultz’s search for the truth; he would be the first to admit that…The best of this book is the author’s abiding faith in eventually finding the truth by pursuing it relentlessly. WHILE LIVING IN BANGLADESH, a friend offered to loan me a copy of this book, but required that I read it only indoors with the curtains drawn, and that I never let anyone know I had a copy of it. It wasn’t until I returned to the US and tracked down a copy that I understood his concern. The Unfinished Revolution contains the final statement of Colonel Abu Taher and a look at his trial and execution under the military government of Ziaur Rahman. A moving story of intrigue and betrayal, the events described in The Unfinished Revolution give background to the decades of corruption and misrule, the effects of which continue to plague Bangladesh. It is unfortunate that this book is no longer in print. For anyone interested in the history of Bangladesh and the Liberation War, it is a must read. Whenever recent events in Bangladesh were discussed in my presence, I would recall two personal incidents which stood out in my mind as two questions. Lawrence Lifschultz, former South Asia Correspondent of the Far Eastern Economic Review has answered these questions in his Bangladesh: The Unfinished Revolution. As a historical record of stormy events in Bangladesh since its birth to the accession to power by General Zia, it will be treated by scholars and journalists alike as a classic. …Let me add one more item of indirect evidence to the list that Lifschultz has presented. This is the second incident mentioned in the first sentence of this review. In one of his campaign speeches Jimmy Carter [when he was first running for President] made a curious reference to Bangladesh that has puzzled me no end. Carter stopped over in Sacramento, capital of California, the night before election day. I was the only Bengali in the small crowd that had collected in front of the hotel where he spoke. It was a routine campaign speech which I’ve forgotten, but a part of it sticks in my memory. He said that he would stop undercover operations of the type for which the CIA had been criticized “whether in Chile or Bangladesh”. I vividly remember the juxtaposition of the two countries; reports of CIA involvement in one was well known but in the other it was a matter of gossip and speculation among Indian and Bangladeshi journalists. The association of Chile with Bangladesh surprised me. I thought it could be a slip of the tongue or a matter of rhetoric. In either case, I wondered, why a tongue-twisting name like Bangladesh over names that are easier to pronounce? Another interpretation, one that will put me solidly in Lifschultz’s corner, was that as a Presidential candidate, Carter was briefed regularly by the Ford Administration, that he learnt about CIA operations in Bangladesh and deliberately included it in his speech for effect. The story that Lifschultz tells us is Shakespearean in grandeur and depravity; it is no Old Wives’ Tale packaged as new journalism. Generally a change of regime in a Third World Country is a simple, often transparent affair; the whys and wherefores are pretty obvious. One of the glaring exceptions was the downfall of Sheikh Mujib…All those interested in the subject will eagerly seize upon Lawrence Lifschultz’s Bangladesh: The Unfinished Revolution.
. . . this slim volume packs a great deal of information not previously available to common readers besides throwing much light on the vulnerability of patchwork political structures to manipulation by a Big Brother and its local allies. The credentials of Lawrence Lifschultz are quite impressive. In 1974 he was the resident correspondent of the Far Eastern Economic Review in Bangladesh and in 1975 he moved to New Delhi [for the Review] to cover the entire subcontinent. Working at present on a doctoral thesis at King’s College, Cambridge, he has also written on South Asian affairs for The Guardian, The Washington Post and the New Statesman. He has had the good fortune of gaining access to sources of information in the countries of his assignment that are often barred to the native newsman. He also reveals in the present work itself, a remarkable degree of persistence in the search for truth. Lawrence Lifschultz has been giving us much food for thought lately. More pointedly, he has been informing us, to our undying shame, of all the things we have not done in this country over the past three decades and more. What concerns us is the terrible manner in which the life of a good soldier, a valiant freedom fighter, was put to an end through what was clearly a sham trial in 1976. Of course, we have known that all these years. Unlike Lifschultz, though, we have stayed quiet about it. When Lifschultz speaks, thirty years after the hanging of Taher about all the dirt and mud we have not yet removed from our society, he speaks for us…We stayed conveniently silent, afraid of the repercussions of protest. But truth does have a way of coming back to us and at us. It has now come to us in the form of Lawrence Lifschultz.